BAPI(Business Application Programming Interface ) : is defined as an interface providing access to business processes and data in R/3 business application systems. Or BAPI is a set of interfaces to object-oriented programming methods that enable a programmer to integrate third-party software into R/3 product from SAP. 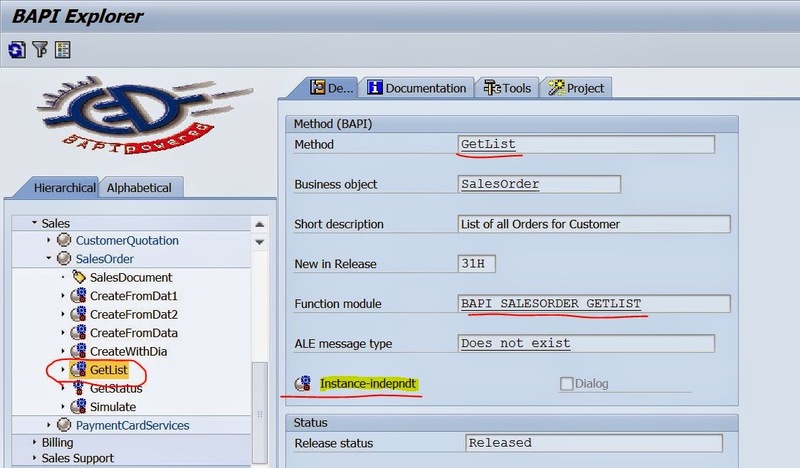 BAPIs are defined as API methods of SAP business object types but implemented as remote enabled Function modules . These business object types and their BAPIs are described and stored in the Business Object Repository (BOR). An External Application System (May be as SAP system or any other system uses programming language like Java Or Visual Basic Or C++ ) can make a call to BAPI. 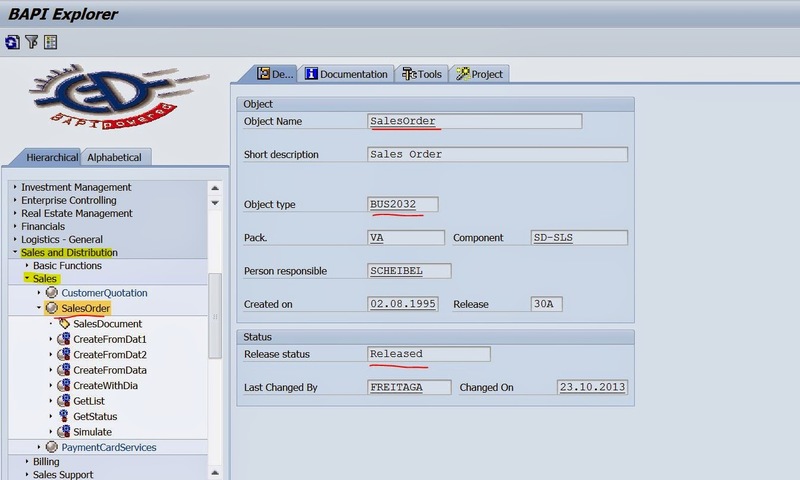 SAP Business Objects: Real time objects, such as a sales order/billing doc can be represented as business objects in business application systems ( R/3). 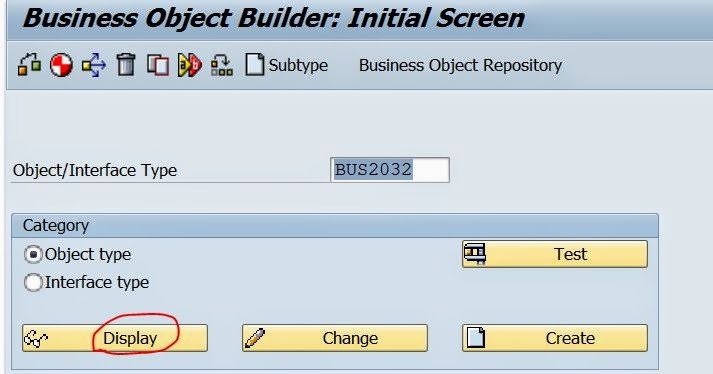 SAP Business Objects can be created with Tcode- SWO1 called as Business Object Repository. 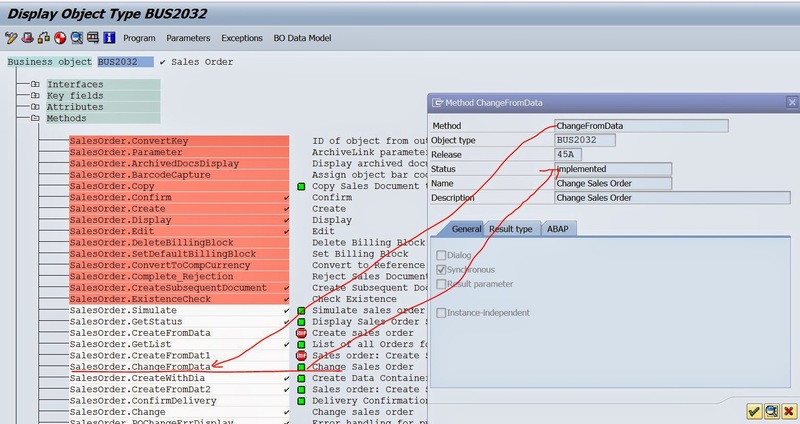 This BO Repository allows to define Business Object, their interfaces and BAPIs(API Methods). BAPIs can be located in the Transaaction: BAPI. (BAPI Explorer). Step1. Go to Tx- SWO1. Step3. 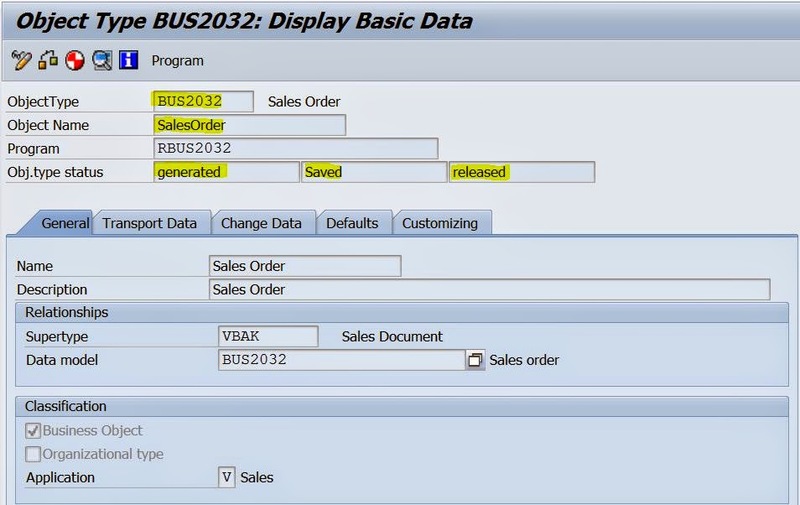 Select a business Object- let’s say- BUS2032- Sales Order. Step4. Click on Display button. Step5. Double click on the Object Name to get to know the details. Step6. We can see the Object Type Status & Go Back. Step7. Expand the Methods option from the Tree structure. Red Color status for some method indicates that they are Obsolete and no longer SAP Supports for that. Step8. Green color status without tick mark indicates that the Method is Implemented but not released. Step9. Green color status with tick mark indicates that the Method is Implemented and also released. Step10. For some method we can find the FM also. Step11. Some methods are Instance Independent. Step12. Some methods are Instance dependent. Step13. To read the Business Objects and Methods The Tx- BAPI can be used. Step14. 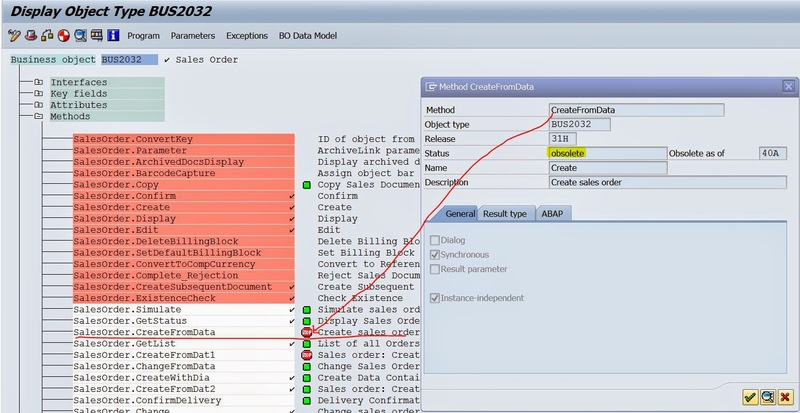 Select the Sales Order Business Object. BAPI’s of two kinds: Instance Dependent & Instance Independent. Instance dependent BAPIs use particular instance of the object which the application should specify in the key field of the business object. The above BAPI: Salesoder.GetStatus() when called it should be passed with the value (SALESDOCUMENT, VBELN). 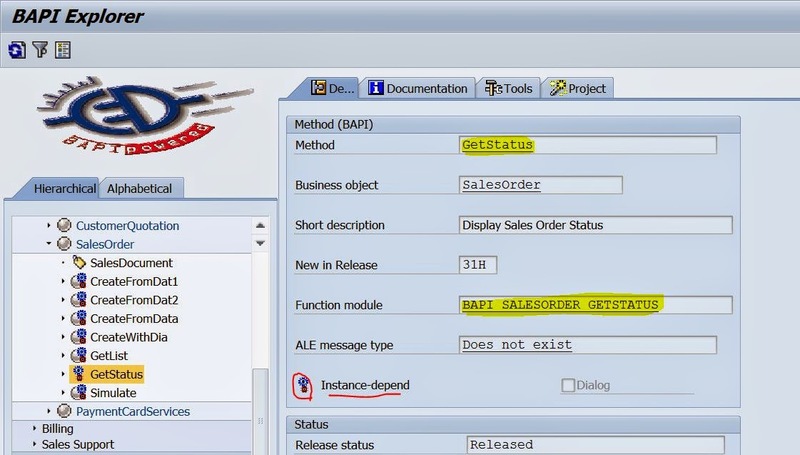 Instance dependent BAPIs do not use particular instance of the Business Object type. They mostly return a list of instances in a table to the calling program.The above BAPI: Salesoder.GetList() is na example of instance independent BAPI.